Sekiya, T., Miyazaki, K., Ogochi, K., Sudo K., and Takigawa, M.: Global high-resolution simulations of tropospheric nitrogen dioxide using CHASER V4.0, Geosci. Model Dev., 11, 959-988, https://doi.org/10.5194/gmd-11-959-2018, 2018. Liang, C.-K., West, J. J., Silva, R. A., Bian, H., Chin, M., Dentener, F. J., Davila, Y., Emmons, L., Folberth, G., Flemming, J., Henze, D., Im, U., Jonson, J. E., Kucsera, T., Keating, T. J., Lund, M. T., Lenzen, A., Lin, M., Pierce, R. B., Park, R. J., Pan, X., Sekiya, T., Sudo K., and Takemura, T.: HTAP2 multi-model estimates of premature human mortality due to intercontinental transport of air pollution, Atmos. Chem. Phys. Discuss., https://doi.org/10.5194/acp-2017-1221, in review, 2018. Tan, J., Fu, J. S., Dentener, F., Sun, J., Emmons, L., Tilmes, S., Sudo K., Flemming, J., Jonson, J. E., Gravel, S., Bian, H., Henze, D., Lund, M. T., Kucsera, T., Takemura, T., and Keating, T.: Multi-model study of HTAP II on sulphur and nitrogen deposition, Atmos. Chem. Phys. Discuss., https://doi.org/10.5194/acp-2017-1121, in review, 2018. Galmarini, S., Kioutsioukis, I., Solazzo, E., Alyuz, U., Balzarini, A., Bellasio, R., Benedictow, A. M. K., Bianconi, R., Bieser, J., Brandt, J., Christensen, J. H., Colette, A., Curci, G., Davila, Y., Dong, X., Flemming, J., Francis, X., Fraser, A., Fu, J., Henze, D., Hogrefe, C., Im, U., Garcia Vivanco, M., Jiménez-Guerrero, P., Jonson, J. E., Kitwiroon, N., Manders, A., Mathur, R., Palacios-Peña, L., Pirovano, G., Pozzoli, L., Prank, M., Schultz, M., Sokhi, R. S., Sudo K., Tuccella, P., Takemura, T., Sekiya, T., and Unal, A.: Two-scale multi-model ensemble: Is a hybrid ensemble of opportunity telling us more?, Atmos. Chem. Phys. Discuss., https://doi.org/10.5194/acp-2018-86, in review, 2018. Dhomse, S., Kinnison, D., Chipperfield, M. P., Cionni, I., Hegglin, M., Abraham, N. L., Akiyoshi, H., Archibald, A. T., Bednarz, E. M., Bekki, S., Braesicke, P., Butchart, N., Dameris, M., Deushi, M., Frith, S., Hardiman, S. C., Hassler, B., Horowitz, L. W., Hu, R.-M., Jöckel, P., Josse, B., Kirner, O., Kremser, S., Langematz, U., Lewis, J., Marchand, M., Lin, M., Mancini, E., Marécal, V., Michou, M., Morgenstern, O., O'Connor, F. M., Oman, L., Pitari, G., Plummer, D. A., Pyle, J. A., Revell, L. E., Rozanov, E., Schofield, R., Stenke, A., Stone, K., Sudo K., Tilmes, S., Visioni, D., Yamashita, Y., and Zeng, G. (2018) Estimates of Ozone Return Dates from Chemistry-Climate Model Initiative Simulations, Atmos. Chem. Phys. Discuss., https://doi.org/10.5194/acp-2018-87. Bian, H., Chin, M., Hauglustaine, D. A., Schulz, M., Myhre, G., Bauer, S. E., Lund, M. T., Karydis, V. A., Kucsera, T. L., Pan, X., Pozzer, A., Skeie, R. B., Steenrod, S. D., Sudo K., Tsigaridis, K., Tsimpidi, A. P., and Tsyro, S. G. (2017) Investigation of global particulate nitrate from the AeroCom phase III experiment, Atmos. Chem. Phys., 17, 12911-12940, https://doi.org/10.5194/acp-17-12911-2017. Anderson, D. C., J. M. Nicely, G. M. Wolfe, T. F. Hanisco, R. J. Salawitch, T. P. Canty, R. R. Dickerson, E. C. Apel, S. Baidar, T. J. Bannan, N. J. Blake, D. X. Chen, B. Dix, R. P. Fernandez, S. R. Hall, R. S. Hornbrook, L. G. Huey, B. Josse, P. Jockel, D. E. Kinnison, T. K. Koenig, M. Le Breton, V. Marecal, O. Morgenstern, L. D. Oman, L. L. Pan, C. Percival, D. Plummer, L. E. Revell, E. Rozanov, A. Saiz-Lopez, A. Stenke, Sudo K., S. Tilmes, K. Ullmann, R. Volkamer, A. J. Weinheimer and G. Zeng (2017) Formaldehyde in the Tropical Western Pacific: Chemical Sources and Sinks, Convective Transport, and Representation in CAM-Chem and the CCMI Models, J. Geophs. Res.-Atmos., 122(20), 11201-11226, doi:10.1002/2016jd026121. Silva, R. A., J. J. West, J. F. Lamarque, D. T. Shindell, W. J. Collins, G. Faluvegi, G. A. Folberth, L. W. Horowitz, T. Nagashima, V. Naik, S. T. Rumbold, Sudo K., T. Takemura, D. Bergmann, P. Cameron-Smith, R. M. Doherty, B. Josse, I. A. MacKenzie, D. S. Stevenson and G. Zeng (2017) Future global mortality from changes in air pollution attributable to climate change, Nat. Clim. Change, 7(11), 845-845, 10.1038/Nclimate3427. Nagashima, T., Sudo K., Akimoto, H., Kurokawa, J., and Ohara, T. (2017) Long-term change in the contributions of various source regions to surface ozone over Japan, Atmos. Chem. Phys., 17, doi.org/10.5194/acp-17-8231-2017. Morgenstern, O., Hegglin, M. I., Rozanov, E., O'Connor, F. M., Abraham, N. L., Akiyoshi, H., Archibald, A. T., Bekki, S., Butchart, N., Chipperfield, M. P., Deushi, M., Dhomse, S. S., Garcia, R. R., Hardiman, S. C., Horowitz, L. W., Jöckel, P., Josse, B., Kinnison, D., Lin, M., Mancini, E., Manyin, M. E., Marchand, M., Marécal, V., Michou, M., Oman, L. D., Pitari, G., Plummer, D. A., Revell, L. E., Saint-Martin, D., Schofield, R., Stenke, A., Stone, Sudo K., K., Tanaka, T. Y., Tilmes, S., Yamashita, Y., Yoshida, K., and Zeng, G. (2017) Review of the global models used within the Chemistry-Climate Model Initiative (CCMI), Geosci. Model Dev., 10, 639-671 doi:10.5194/gmd-10-639-2017. Huang, M., Carmichael, G. R., Pierce, R. B., Jo, D. S., Park, R. J., Flemming, J., Emmons, L. K., Bowman, K. W., Henze, D. K., Davila, Y., Sudo K., Jonson, J. E., Lund, M. T., Janssens-Maenhout, G., Dentener, F. J., Keating, T. J., Oetjen, H., and Payne, V. H.　(2017) Impact of Intercontinental Pollution Transport on North American Ozone Air Pollution: An HTAP Phase II Multi-model Study, Atmos. Chem. Phys., 17, 5721-5750, doi:10.5194/acp-17-5721-2017. Trieu, TTN, D. Goto, H. Yashiro, R. Murata, K. Sudo, H. Tomita, M. Satoh, T. Nakajima (2017) Evaluation of summertime surface ozone in Kanto area of Japan using a semi-regional model and observation, Atmos. Environ. 153, 163-181. Miyazaki, K., Eskes, H., Sudo, K., Boersma, K. F., Bowman, K., and Kanaya Y. (2017) Decadal changes in global surface NOx emissions from multi-constituent satellite data assimilation, Atmos. Chem. Phys., 17, 807-837, doi:10.5194/acp-17-807-2017. Sudo, K. (2016) Interannual variability and long-term trends in global tropospheric ozone and related chemistry during recent decades, (key-note talk) Quadrennial Ozone Symposium 2016, Edinburgh, United Kingdom. Stjern, C. W., Samset, B. H., Myhre, G., Bian, H., Chin, M., Davila, Y., Dentener, F., Emmons, L., Flemming, J., Haslerud, A. S., Henze, D., Jonson, J. E., Kucsera, T., Lund, M. T., Schulz, M., Sudo, K., Takemura, T., and Tilmes, S. (2016) Global and regional radiative forcing from 20 % reductions in BC, OC and SO4 – an HTAP2 multi-model study, Atmos. Chem. Phys., 16, 13579-13599, doi:10.5194/acp-16-13579-2016. Sekiya, T., K. Sudo, and. T. Nagai (2016) Evolution of stratospheric sulfate aerosol from the 1991 Pinatubo eruption: Roles of aerosol microphysical processes, J. Geophys. Res. doi: 10.1002/2015jd024313. Silva, R. A., West, J. J., Lamarque, J.-F., Shindell, D. T., Collins, W. J., Dalsoren, S., Faluvegi, G., Folberth, G., Horowitz, L. W., Nagashima, T., Naik, V., Rumbold, S. T., Sudo, K., Takemura, T., Bergmann, D., Cameron-Smith, P., Cionni, I., Doherty, R. M., Eyring, V., Josse, B., MacKenzie, I. A., Plummer, D. S., Righi, M., Stevenson, D. S., Strode, S., Szopa, S., and Zeng, G. (2016) The effect of future ambient air pollution on human premature mortality to 2100 using output from the ACCMIP model ensemble, Atmos. Chem. Phys., 16, 9847-9862, doi:10.5194/acp-16-9847-2016. Franco, B., E Mahieu, L K Emmons, Z A Tzompa-Sosa, E V Fischer, K Sudo, B Bovy, S Conway, D Griffin, J W Hannigan, K Strong, K A Walker　(2016)　Evaluating ethane and methane emissions associated with the development of oil and natural gas extraction in North America, Environ., Res., Lett., 11 044010, doi:10.1088/1748-9326/11/4/044010. Akimoto, H., J. Kurokawa, K. Sudo, T. Nagashima, T. Takemura, Z. Klimont, M. Amann, K. Suzuki (2015): SLCP co-control approach in East Asia: Tropospheric ozone reduction strategy by simultaneous reduction of NOx/NMVOC and methane, Atmos. Environ., 122, 588-595, doi:10.1016/j.atmosenv.2015.10.003. Miyazaki,K., H. J. Eskes, and K. Sudo (2015): A tropospheric chemistry reanalysis for the years 2005–2012 based on an assimilation of OMI, MLS, TES and MOPITT satellite data, Atmos. Chem. Phys., 15, 8315-8348. Ishijima,K., M. Takigawa, K. Sudo, S. Toyoda, N. Yoshida, T. Röckmann, J. Kaiser, S. Aoki, S. Morimoto, S. Sugawara, and T. Nakazawa (2015): Development of an atmospheric N2O isotopocule model and optimization procedure, and application to source estimation, Atmos. Chem. Phys. Discuss., 15, 19947-20011. Schnell,J.L., M. J. Prather, B. Josse, V. Naik, L. W. Horowitz, P. Cameron-Smith, D. Bergmann, G. Zeng, D. A. Plummer, K. Sudo, T. Nagashima, D. T. Shindell, G. Faluvegi, and S. A. Strode (2015): Use of North American and European air quality networks to evaluate global chemistry-climate modeling of surface ozone, Atmos. Chem. Phys., 15, 10581-10596, doi:10.5194/acp-15-10581-2015. Franco, B., Bader, W., Toon, G. C., Bray, C., Perrin, A., Fischer, E. V., Sudo, K., Boone, C. D., Bovy, B., Lejeune, B., Servais, C., and Mahieu, E. (2015): Retrieval of ethane from ground-based FTIR solar spectra using improved spectroscopy: Recent burden increase above Jungfraujoch, J Quant Spectrosc Ra, 160, 36-49, 10.1016/j.jqsrt.2015.03.017. Tang, L., Nagashima, T., Hasegawa, K., Ohara, T., Sudo, K., and Itsubo, N. (2015): Development of human health damage factors for PM2.5 based on a global chemical transport model, Int. J. Life Cycle Assess., 10.1007/s11367-014-0837-8. Tang, L., Nagashima, T., Hasegawa, K., Ohara, T., Sudo, K., and Itsubo, N. (2015): Development of human health damage factors for tropospheric ozone considering transboundary transport on a global scale, Int. J. Life Cycle Assess., 10.1007/s11367-015-　\1001-9. 須藤 健悟 (2014)：地球温暖化 第４講 大気汚染と地球温暖化, 大気環境学会誌 Vol. 49 No. 2 p. A25-A35. Kanaya, Y., H. Irie, H. Takashima, H. Iwabuchi, H. Akimoto, K. Sudo, M. Gu, J. Chong, Y. J. Kim, H. Lee, A. Li, F. Si, J. Xu, P.-H. Xie, W.-Q. Liu, A. Dzhola, O. Postylyakov, V. Ivanov, E. Grechko, S. Terpugova, and M. Panchenko: Atmos. (2014): Long-term MAX-DOAS network observations of NO2 in Russia and Asia (MADRAS) during the period 2007–2012: instrumentation, elucidation of climatology, and comparisons with OMI satellite observations and global model simulations, Chem. Phys., 14, 7909-7927. Miyazaki, K., H. J. Eskes, K. Sudo, and C. Zhang (2014): Global lightning NOx production estimated by an assimilation of multiple satellite data sets, Atmos. Chem. Phys., 14, 3277-3305. Kirschke, S., P. Bousquet, P. Ciais, K. Sudo, et al. (2013): Three decades of global methane sources and sinks, Nature Geosci., 6, 813–823, doi:10.1038/ngeo1955. Naik, V., Voulgarakis, A., Fiore, A. M., K. Sudo, et al. (2013): Preindustrial to present-day changes in tropospheric hydroxyl radical and methane lifetime from the Atmospheric Chemistry and Climate Model Intercomparison Project (ACCMIP), Atmos. Chem. Phys., 13, 5277-5298, doi:10.5194/acp-13-5277-2013. Bowman, K. W., Shindell, D. T., Worden, H. M., Sudo K., et al. (2013): Evaluation of ACCMIP outgoing longwave radiation from tropospheric ozone using TES satellite observations, Atmos. Chem. Phys., 13, 4057-4072, doi:10.5194/acp-13-4057-2013. Stevenson, D. S., Young, P. J., Naik, V., K. Sudo, et al. (2013): Tropospheric ozone changes, radiative forcing and attribution to emissions in the Atmospheric Chemistry and Climate Model Intercomparison Project (ACCMIP), Atmos. Chem. Phys., 13, 3063-3085, doi:10.5194/acp-13-3063-2013. Shindell, D. T., Lamarque, J.-F., Schulz, M., K. Sudo, et al. (2013): Radiative forcing in the ACCMIP historical and future climate simulations, Atmos. Chem. Phys., 13, 2939-2974, doi:10.5194/acp-13-2939-2013. Young, P. J., A. T. Archibald, K. W. Bowman, J.-F. Lamarque, K. Sudo, et al. (2013): Pre-industrial to end 21st century projections of tropospheric ozone from the Atmospheric Chemistry and Climate Model Intercomparison Project (ACCMIP), Atmos. Chem. Phys., 13, 2063-2090. J.-F. Lamarque, D. T. Shindell, B. Josse, P. J. Young, K. Sudo, et al. (2013): The Atmospheric Chemistry and Climate Model Intercomparison Project (ACCMIP): overview and description of models, simulations and climate diagnostics, Geosci. Model Dev., 6, 179-206. Eyring, V., J. M. Arblaster, I. Cionni, K. Sudo, et al. (2013): Long-term ozone changes and associated climate impacts in CMIP5 simulations, J. Geophys. Res. Atmos., 118, 5029–5060, doi:10.1002/jgrd.50316. Silva, R. A., J. J. West, Y. Q. Zhang, S. C. Anenberg, J. F. Lamarque, D. T. Shindell, W. J. Collins, S. Dalsoren, G. Faluvegi, G. Folberth, L. W. Horowitz, T. Nagashima, V. Naik, S. Rumbold, R. Skeie, K. Sudo, T. Takemura, D. Bergmann, P. Cameron-Smith, I. Cionni, R. M. Doherty, V. Eyring, B. Josse, I. A. MacKenzie, D. Plummer, M. Righi, D. S. Stevenson, S. Strode, S. Szopa and G. Zeng (2013): Global premature mortality due to anthropogenic outdoor air pollution and the contribution of past climate change, Environmental Research Letters 8(3), doi:10.1088/1748-9326/8/3/034005. 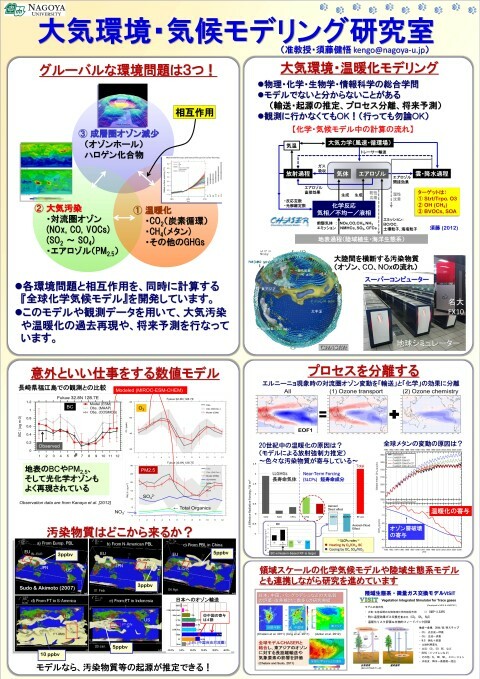 T. Sekiya and K. Sudo (2012), Role of meteorological variability in global tropospheric ozone during 1970–2008, J. Geophys. Res., 117, D18303, doi:10.1029/2012JD018054. Muntaseer Billah Ibn Azkar M. A., S. Chatani, and K. Sudo (2012), Simulation of urban and regional air pollution in Bangladesh, J. Geophys. Res., 117, D07303, doi:10.1029/2011JD016509. Miyazaki, K., Eskes, H. J., and K. Sudo: Global NOx emission estimates derived from an assimilation of OMI tropospheric NO2 columns, Atmos. Chem. Phys., 12, 2263-2288, doi:10.5194/acp-12-2263-2012, 2012. Chatani, S. and K. Sudo: Influences of the variation in inflow to East Asia on surface ozone over Japan during 1996–2005, Atmos. Chem. Phys., 11, 8745-8758, doi:10.5194/acp-11-8745-2011, 2011. Watanabe, S., K. Sudo, T. Nagashima, T. Takemura, H. Kawase, and T. Nozawa (2011), Future projections of surface UV-B in a changing climate, J. Geophys. Res., 116, D16118, doi:10.1029/2011JD015749. Yashiro, H., K. Sudo, Yonemura, S., and Takigawa, M.: The impact of soil uptake on the global distribution of molecular hydrogen: chemical transport model simulation, Atmos. Chem. Phys., 11, 6701-6719, doi:10.5194/acp-11-6701-2011, 2011. Goto, D., Nakajima, T., Takemura, T., and Sudo, K.: A study of uncertainties in the sulfate distribution and its radiative forcing associated with sulfur chemistry in a global aerosol model, Atmos. Chem. Phys., 11, 10889-10910, doi:10.5194/acp-11-10889-2011, 2011. Watanabe, S., Hajima, T., Sudo,K., Nagashima, T., Takemura, T., Okajima, H., Nozawa, T., Kawase, H., Abe, M., Yokohata, T., Ise, T., Sato, H., Kato, E., Takata, K., Emori, S., and Kawamiya, M.: MIROC-ESM 2010: model description and basic results of CMIP5-20c3m experiments, Geosci. Model Dev., 4, 845-872, doi:10.5194/gmd-4-845-2011, 2011. Nagashima, T., Ohara, T., Sudo, K., and Akimoto, H.: The relative importance of various source regions on East Asian surface ozone, Atmos. Chem. Phys. Discuss., 10, 9077-9120, doi:10.5194/acpd-10-9077-2010, 2010. Jonson, J. E., Stohl, A., Fiore, A. M., Hess, P., Szopa, S., Wild, O., Zeng, G., Dentener, F. J., Lupu, A., Schultz, M. G., Duncan, B. N., Sudo, K., Wind, P., Schulz, M., Marmer, E., Cuvelier, C., Keating, T., Zuber, A., Valdebenito, A., Dorokhov, V., De Backer, H., Davies, J., Chen, G. H., Johnson, B., Tarasick, D. W., St�・bi, R., Newchurch, M.J., von der Gathen, P., Steinbrecht, W., and Claude, H.: A multi-model analysis of vertical ozone profiles, Atmos. Chem. Phys., 10, 5759-5783, doi:10.5194/acp-10-5759-2010, 2010. Yashiro, H., S. Sugawara, K. Sudo, S. Aoki, and T. Nakazawa (2009), Temporal and spatial variations of carbon monoxide over the western part of the Pacific Ocean, J. Geophys. Res., 114, D08305, doi:10.1029/2008JD010876. Watanabe, S., H. Miura, M. Sekiguchi, T. Nagashima, K. Sudo, S. Emori, and M. Kawamiya (2008), Development of an Atmospheric General Circulation Model for Integrated Earth System Modeling on the Earth Simulator, J. Earth Sim., 9, 27-35. Eyring, V., Stevenson, D. S., Lauer, A., Sudo, K. et al. (2007): Multi-model simulations of the impact of international shipping on Atmospheric Chemistry and Climate in 2000 and 2030, Atmos Chem Phys, 7, 757-780. Ito, A., Sudo, K., Akimoto, H., Sillman, S., and Penner, J. E. (2007): Global modeling analysis of tropospheric ozone and its radiative forcing from biomass burning emissions in the twentieth century, J Geophys Res-Atmos, 112, D24307, 10.1029/2007jd008745. Dentener, F., Drevet, J., Lamarque, J. F., Sudo, K., et al. (2006): Nitrogen and sulfur deposition on regional and global scales: A multimodel evaluation, Global Biogeochem Cy, 20, 10.1029/2005gb002672. Dentener, F., Stevenson, D., Ellingsen, K., Sudo, K., et al. (2006): The global atmospheric environment for the next generation, Environ Sci Technol, 40, 3586-3594, 10.1021/es0523845. Gauss, M., Myhre, G., Isaksen, I. S. A., Sudo, K., et al. (2006) Radiative forcing since preindustrial times due to ozone change in the troposphere and the lower stratosphere, Atmos Chem Phys, 6, 575-599. Shindell, D. T., Faluvegi, G., Stevenson, Sudo, K., et al. (2006): Multimodel simulations of carbon monoxide: Comparison with observations and projected near-future changes, J Geophys Res-Atmos, 111, D19306, 10.1029/2006jd007100. Stevenson, D. S., Dentener, F. J., Schultz, M. G., Sudo, K., et al. (2006): Multimodel ensemble simulations of present-day and near-future tropospheric ozone, J Geophys Res-Atmos, 111, D08301, 10.1029/2005jd006338. van Noije, T. P. C., Eskes, H. J., Dentener, F. J., Sudo, K. et al. (2006): Multi-model ensemble simulations of tropospheric NO2 compared with GOME retrievals for the year 2000, Atmos Chem Phys, 6, 2943-2979. Irie, H., K. Sudo, H. Akimoto, A, Richter, J.P. Burrows, T. Wagner, M. Wenig, S. Beirle, Y. Kondo, V.P. Sinyakov, and F. Goutail (2005) Evaluation of long-term tropospheric NO2 data obtained by GOME over East Asia in 1996-2002, Geophys. Res. Letters., 32, L11810 doi:10.1029/2005GL022770. Takigawa M., K. Sudo, H. Akimoto, K. Kita, N. Takegawa, Y. Kondo, and M. Takahashi (2005) Estimation of the contribution of intercontinental transport during the PEACE campaign by using a global model, J. Geophys. Res., 110, D21313, doi:10.1029/2005JD006226. Kawamiya, M., C. Yoshikawa, T. Kato, H. Sato, K. Sudo, S. Watanabe, and T. Matsuno, Development of an Integrated Earth System Model on the Earth simulator, J. Earth Sim. Zhu, B., H. Akimoto, Z. Wang, K. Sudo, J. Tang, and I. Uno (2004) Why does surface ozone peak in summertime at Waliguan? Geophys. Res. Letters., 31, L17104 10.1029/2004GL020609. Sudo, K., M. Takahashi, J. Kurokawa, and H. Akimoto (2002) CHASER: A global chemical model of the troposphere 1. Model description, J. Geophys. Res., 107, 10.1029/2001JD001113. Sudo, K., M. Takahashi, and H. Akimoto (2002) CHASER: A global chemical model of the troposphere 2. Model results and evaluation, J. Geophys. Res., 107, 10.1029/2001/JD001114.